The motor from a 3.5" floppy disk drive. The coils, arranged radially, are made from copper wire coated with blue insulation. The balanced rotor (upper right) has been removed and turned upside-down. The grey ring inside its cup is a permanent magnet. A brushless DC electric motor (BLDC motor or BL motor), also known as electronically commutated motor (ECM or EC motor) and synchronous DC motors, are synchronous motors powered by DC electricity via an inverter or switching power supply which produces an AC electric current to drive each phase of the motor via a closed loop controller. The controller provides pulses of current to the motor windings that control the speed and torque of the motor. An electric motor develops torque by alternating the polarity of rotating magnets attached to the rotor, the rotating part of the machine, and stationary magnets on the stator which surrounds the rotor. One or both sets of magnets are electromagnets, made of a coil of wire wound around an iron core. DC running through the wire winding creates the magnetic field, providing the power which runs the motor. However, each time the rotor rotates by 180° (a half-turn), the position of the north and south poles on the rotor are reversed. If the magnetic field of the poles remained the same, this would cause a reversal of the torque on the rotor each half-turn, and so the average torque would be zero and the rotor would not turn. Therefore, in a DC motor, in order to create torque in one direction, the direction of electric current through the windings must be reversed with every 180° turn of the rotor (or turned off during the time that it is in the wrong direction). This reverses the direction of the magnetic field as the rotor turns, so the torque on the rotor is always in the same direction. In brushed motors, invented in the 19th century, this is done with a rotary switch on the motor's shaft called a commutator. It consists of a rotating cylinder divided into multiple metal contact segments on the rotor. The segments are connected to wire electromagnet windings on the rotor. 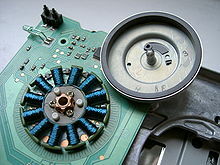 Two or more stationary contacts called "brushes", made of a soft conductor like graphite press against the commutator, making sliding electrical contact with successive segments as the rotor turns, providing electric current to the windings. Each time the rotor rotates by 180° the commutator reverses the direction of the electric current applied to a given winding, so the magnetic field creates a torque in one direction. The friction of the brushes sliding along the rotating commutator segments causes power losses that can be significant in a low power motor. The soft brush material wears down due to friction, creating dust, and eventually the brushes must be replaced. This makes commutated motors unsuitable for low particulate or sealed applications like hard disk motors. The resistance of the sliding brush contact causes a voltage drop in the motor circuit called brush drop which consumes energy. The repeated abrupt switching of the current through the inductance of the windings causes sparks at the commutator contacts. These are a fire hazard in explosive atmospheres and a source of degrading UV radiation, and create electronic noise, which can cause electromagnetic interference in nearby microelectronic circuits. During the last hundred years high power DC brushed motors, once the mainstay of industry, were replaced by alternating current (AC) synchronous motors. Today brushed motors are only used in low power applications or where only DC is available, but the above drawbacks limit their use even in these applications. Brushless motors were invented to solve these problems. The development of semiconductor electronics in the 1970s allowed the commutator and brushes to be eliminated in DC motors. In brushless DC motors, an electronic servo system replaces the mechanical commutator contacts. An electronic sensor detects the angle of the rotor, and controls semiconductor switches such as transistors which switch current through the windings, either reversing the direction of the current, or in some motors turning it off, at the correct time each 180° shaft rotation so the electromagnets create a torque in one direction. The elimination of the sliding contact allows brushless motors to have less friction and longer life; their working life is only limited by the lifetime of their bearings. Brushed DC motors develop a maximum torque when stationary, linearly decreasing as velocity increases. Some limitations of brushed motors can be overcome by brushless motors; they include higher efficiency and a lower susceptibility to mechanical wear. These benefits come at the cost of potentially less rugged, more complex, and more expensive control electronics. A typical brushless motor has permanent magnets which rotate around a fixed armature, eliminating problems associated with connecting current to the moving armature. An electronic controller replaces the brush/commutator assembly of the brushed DC motor, which continually switches the phase to the windings to keep the motor turning. The controller performs similar timed power distribution by using a solid-state circuit rather than the brush/commutator system. Brushless motors offer several advantages over brushed DC motors, including high torque to weight ratio, more torque per watt (increased efficiency), increased reliability, reduced noise, longer lifetime (no brush and commutator erosion), elimination of ionizing sparks from the commutator, and overall reduction of electromagnetic interference (EMI). With no windings on the rotor, they are not subjected to centrifugal forces, and because the windings are supported by the housing, they can be cooled by conduction, requiring no airflow inside the motor for cooling. This in turn means that the motor's internals can be entirely enclosed and protected from dirt or other foreign matter. Brushless motor commutation can be implemented in software using a microcontroller or microprocessor computer, or may alternatively be implemented in analogue hardware, or in digital firmware using a field-programmable gate array (FPGA). Commutation with electronics instead of brushes allows for greater flexibility and capabilities not available with brushed DC motors, including speed limiting, "micro stepped" operation for slow and/or fine motion control, and a holding torque when stationary. Controller software can be customized to the specific motor being used in the application, resulting in greater commutation efficiency. The maximum power that can be applied to a brushless motor is limited almost exclusively by heat; too much heat weakens the magnets and will damage the winding's insulation. Environments and requirements in which manufacturers use brushless-type DC motors include maintenance-free operation, high speeds, and operation where sparking is hazardous (i.e. explosive environments) or could affect electronically sensitive equipment. The construction of a brushless motor may resemble that of a stepper motor. Unlike a stepper, a brushless motor is usually intended to produce continuous rotation. Stepper motors generally do not include a shaft position sensor for internal feedback of the rotor position. Instead a stepper controller will rely on a sensor to detect the position of the driven device. They are frequently stopped with the rotor in a defined angular position while still producing torque. A well designed brushless motor system can also be held at zero rpm and finite torque. Because the controller implements the traditional brushes' functionality it needs the rotor's orientation/position (relative to the stator coils). This is automatic in a brushed motor due to the fixed geometry of rotor shaft and brushes. Some designs use Hall effect sensors or a rotary encoder to directly measure the rotor's position. Others measure the back-EMF in the undriven coils to infer the rotor position, eliminating the need for separate Hall effect sensors, and therefore are often called sensorless controllers. A typical controller contains 3 bi-directional outputs (i.e., frequency controlled three phase output), which are controlled by a logic circuit. Simple controllers employ comparators to determine when the output phase should be advanced, while more advanced controllers employ a microcontroller to manage acceleration, control speed and fine-tune efficiency. Controllers that sense rotor position based on back-EMF have extra challenges in initiating motion because no back-EMF is produced when the rotor is stationary. This is usually accomplished by beginning rotation from an arbitrary phase, and then skipping to the correct phase if it is found to be wrong. This can cause the motor to run briefly backwards, adding even more complexity to the startup sequence. Other sensorless controllers are capable of measuring winding saturation caused by the position of the magnets to infer the rotor position. Two key performance parameters of brushless DC motors are the motor constants KT (torque constant) and Ke (back-EMF constant also known as speed constant KV = 1/Ke ). There are two common electrical winding configurations; the delta configuration connects three windings to each other (series circuits) in a triangle-like circuit, and power is applied at each of the connections. The Wye (Y-shaped) configuration, sometimes called a star winding, connects all of the windings to a central point (parallel circuits) and power is applied to the remaining end of each winding. A motor with windings in delta configuration gives low torque at low speed, but can give higher top speed. Wye configuration gives high torque at low speed, but not as high top speed. Although efficiency is greatly affected by the motor's construction, the Wye winding is normally more efficient. In delta-connected windings, half voltage is applied across the windings adjacent to the driven lead (compared to the winding directly between the driven leads), increasing resistive losses. In addition, windings can allow high-frequency parasitic electrical currents to circulate entirely within the motor. A Wye-connected winding does not contain a closed loop in which parasitic currents can flow, preventing such losses. From a controller standpoint, the two styles of windings are treated exactly the same. The four poles on the stator of a two-phase brushless motor. This is part of a computer cooling fan; the rotor has been removed. Brushless motors fulfill many functions originally performed by brushed DC motors, but cost and control complexity prevents brushless motors from replacing brushed motors completely in the lowest-cost areas. 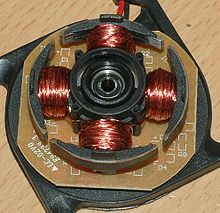 Nevertheless, brushless motors have come to dominate many applications, particularly devices such as computer hard drives and CD/DVD players. Small cooling fans in electronic equipment are powered exclusively by brushless motors. They can be found in cordless power tools where the increased efficiency of the motor leads to longer periods of use before the battery needs to be charged. Low speed, low power brushless motors are used in direct-drive turntables for gramophone records. Brushless motors are found in electric vehicles, hybrid vehicles and personal transporters. Most electric bicycles use brushless motors that are sometimes built into the wheel hub itself, with the stator fixed solidly to the axle and the magnets attached to and rotating with the wheel. Most electrically powered RC models use brushless motors because of their high efficiency. Brushless motors are found in many modern cordless tools, including some string trimmers, leaf blowers, saws (circular or reciprocating), and drills/drivers. The advantages of brushless over brushed motors (low weight, high efficiency) are more important to handheld, battery powered tools than to large, stationary tools plugged into an AC outlet, so uptake has been faster in that segment of the market. There is a trend in the heating, ventilation, and air conditioning (HVAC) and refrigeration industries to use brushless motors instead of various types of AC motors. The most significant reason to switch to a brushless motor is the dramatic reduction in power required to operate them versus a typical AC motor. While shaded-pole and permanent split capacitor motors once dominated as the motor of fan, many fans are now run using a brushless motor.[when?] Some fans also use brushless motors in order to increase overall system efficiency. In addition to the brushless motor's higher efficiency, HVAC systems (especially those featuring variable-speed and/or load modulation) use brushless motors because the built-in microprocessor allows for programmability, control over airflow, and serial communication. Some ceiling fan and portable fans are also featuring this motor. They advertise the motor being highly energy efficient and quieter than most fans. Brushless motors are ideally suited for manufacturing applications because of their high power density, good speed-torque characteristics, high efficiency, wide speed ranges and low maintenance. The most common uses of brushless DC motors in industrial engineering are linear motors, servomotors, actuators for industrial robots, extruder drive motors and feed drives for CNC machine tools. Brushless motors are commonly used as pump, fan and spindle drives in adjustable or variable speed applications as they are capable of developing high torque with good speed response. In addition, they can be easily automated for remote control. Due to their construction, they have good thermal characteristics and high energy efficiency. To obtain a variable speed response, brushless motors operate in an electromechanical system that includes an electronic motor controller and a rotor position feedback sensor. Brushless DC motors are widely used as servomotors for machine tool servo drives. Servomotors are used for mechanical displacement, positioning or precision motion control. DC stepper motors can also be used as servomotors; however, since they are operated with open loop control, they typically exhibit torque pulsations. Brushless DC motors are more suitable as servomotors since their precise motion is based upon a closed loop control system that provides tightly controlled and stable operation. Brushless motors are used in industrial positioning and actuation applications. For assembly robots, brushless stepper or servo motors are used to position a part for assembly or a tool for a manufacturing process, such as welding or painting. [disputed – discuss] Brushless motors can also be used to drive linear actuators. Motors that directly produce linear motion are called linear motors. The advantage of linear motors is that they can produce linear motion without the need of a transmission system, such as ballscrews, leadscrew, rack-and-pinion, cam, gears or belts, that would be necessary for rotary motors. Transmission systems are known to introduce less responsiveness and reduced accuracy. Direct drive, brushless DC linear motors consist of a slotted stator with magnetic teeth and a moving actuator, which has permanent magnets and coil windings. To obtain linear motion, a motor controller excites the coil windings in the actuator causing an interaction of the magnetic fields resulting in linear motion. Tubular linear motors are another form of linear motor design operated in a similar way. A microprocessor-controlled BLDC motor powering a micro radio-controlled airplane. This external rotor motor weighs 5 g and consumes approximately 11 W.
Brushless motors have become a popular motor choice for model aircraft including helicopters and drones. Their favorable power-to-weight ratios and wide range of available sizes, from under 5 grams to large motors rated at well into the kilowatt output range, have revolutionized the market for electric-powered model flight, displacing virtually all brushed electric motors, except for low powered inexpensive often toy grade aircraft. They have also encouraged a growth of simple, lightweight electric model aircraft, rather than the previous internal combustion engines powering larger and heavier models. The increased power-to-weight ratio of modern batteries and brushless motors allows models to ascend vertically, rather than climb gradually. The low noise and lack of mass compared to small glow fuel internal combustion engines is another reason for their popularity. Legal restrictions for the use of combustion engine driven model aircraft in some countries, most often due to potential for noise pollution—even with purpose-designed mufflers for almost all model engines being available over the most recent decades—have also supported the shift to high-power electric systems. Their popularity has also risen in the radio-controlled (RC) car area. Brushless motors have been legal in North American RC car racing in accordance to ROAR since 2006. These motors provide a great amount of power to RC racers and, if paired with appropriate gearing and high-discharge Li-Po (lithium polymer) or LiFePO4 batteries, these cars can achieve speeds over 160 kilometres per hour (99 mph). Brushless motors are capable of producing more torque and have a faster peak rotational speed compared to nitro- or gasoline-powered engines. Nitro engines peak at around 46,800 r/min and 2.2 kW (~2.95 hp), while a smaller brushless motor can reach 50,000 r/min and 3.7 kW (~5 hp). Larger brushless RC motors can reach upwards of 10 kW (~13.4 hp) and 28,000 r/min to power 1/5th scale models. ^ a b c d de Silva, Clarence W. (2009). Modeling and Control of Engineering Systems. CRC Press. pp. 632–633. ISBN 1420076876. ^ a b c d Moczala, Helmut (1998). Small Electric Motors. London: Institution of Electrical Engineers. pp. 165–166. ISBN 085296921X. ^ a b c d Xia, Chang-liang (2012). Permanent Magnet Brushless DC Motor Drives and Controls. John Wiley and Sons. pp. 18–19. ISBN 1118188365. ^ M. Gopal. Control systems: principles and design. 2nd ed. Tata McGraw-Hill, 2002. Page 165. ^ Sabrie Soloman. Sensors handbook. 3rd ed. McGraw-Hill, 1999. Page 5-6. ^ Pter Campbel. Permanent Magnet Materials and their Application. Cambridge University Press, 1996. Page 172. ^ M. Gopal. Control systems: principles and design. 2nd ed. Tata McGraw-Hill, 2002. Page 159. ^ Shimon Y. Nof, Wilbert E. Wilhelm and Hans-Jürgen Warnecke. Industrial assembly. Springer, 1997. Page 174. ^ Peng Zhang. Industrial Control Technology: A Handbook for Engineers and Researchers. William Andrew, Inc., 2008. Page 91. ^ Bernstein, Bobby (15 January 2015). "Top 4 Fastest RC Cars for Sale in the World". heavy.com. Retrieved 2 February 2015. As far as THE fastest RC car available for sale is concerned, it is the Traxxas XO-1 Supercar. The XO-1 hits 100mph, with proper LiPos batteries. The maker's product specs indicates the usage of a "Traxxas Big Block brushless motor"
Wikimedia Commons has media related to Brushless DC electric motors. This page was last edited on 11 April 2019, at 14:52 (UTC).